For Charles Lyell, one of Geology’s founding fathers, Geology was “an effort both of the reason and the imagination". Lyell, in establishing the principles of geology, provided a link for the 18th century Romantic artists and poets, between aesthetic experience and the physical formation of the landscape; a link that contributed the development of the sublime, as an aesthetic concept, within 18th century investigations of landscape within European art and literature. If geology can be said to have a ‘geological imagination’, can we not also unravel the structures and processes of geology not simply as a classification system of the earth’s structures and temporal processes, but also as a site of critical enquiry? Sasha Huber has sought to open up the work and legacy of the geologist Louis Agassiz to this process of critical enquiry. 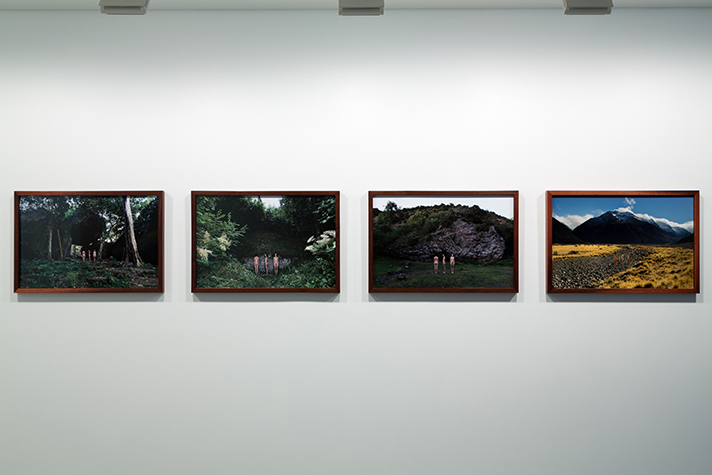 Huber’s visual practice is part of a genre of landscape photography/imagery that investigates the landscape as a system of cultural codes, rather than a specialised genre of photography/image production. Sasha Huber’s intervention into the work and legacy of Louis Agassiz is an investigation into the geological imagination, and into how these processes give cultural meaning to our aesthetic experience of the landscape. Huber’s work investigates geology and the legacy of Louis Agassiz as processes of visualization of the spatial and temporal mapping of the Earth’s surface. Geology as an active form of constructing and defining spatial and temporal narratives, these narratives embed power structures in terms of their naming and the construction of the relations between time, space and place. For the 18th century philosopher Edmund Burke, ‘terror is in all cases whatsoever…the ruling principle of the sublime”, a terror that Burke associates with the black body. Huber’s practice brings to the fore the linkage between landscape, terror and the sublime explored through the legacy of Louis Agassiz. The relationship between terror, the black body and the sublime has been developed by post-colonial critics in to the concept of the ‘racial sublime’, a terrain of violence that is rooted in methods of subjection and denial. Huber’s continuing intervention into the legacy of Agassiz in the landscape is a refusal look away from the residues of subjection and denial within Agassiz’s legacy that are inscribed into 19th century cartographic mapping processes. Huber’s work directs our attention to the understanding of the acts that deny or produce these landscapes as without history or memory, acts that are entangled within landscape sites, naming practices, aesthetics, and cultural memory. It is this epistemological violence of terror – which is inscribed within Agassiz’s geological investigations and species classification. In asserting that there is something to see and explore, by challenging the ‘naturalisation’ of the inscription of Agassiz’s name into the landscape, Huber’s work directs attention to a cultural history that needs to be explored. Huber’s work seeks not to only to acknowledge and bear witness to the historical base of this violence, but to its continuing resonance within the landscape and within visual practices that continue to survey and violate the colonised body.